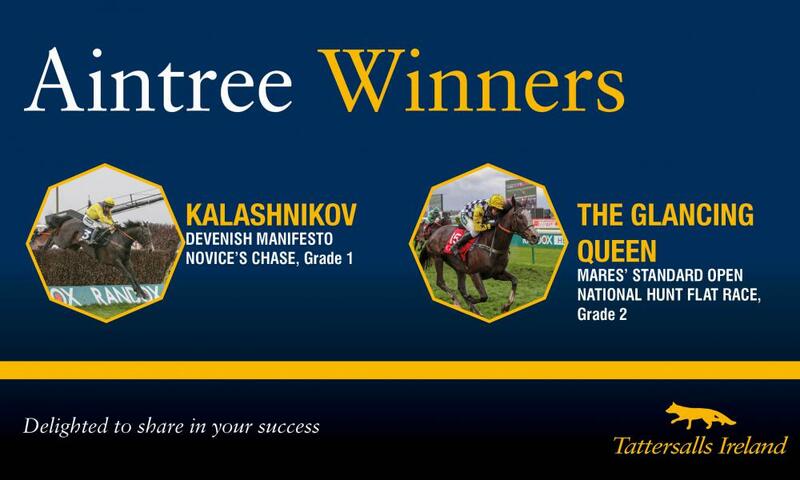 The youngest trainer in the ranks, Newmarket trainer Amy Murphy, recorded her very first Grade 1 victory when landing the Devenish Manifesto Novices' Chase with Paul Murphy's KALASHNIKOV on day one of the Aintree Grand National Festival. A son of Boardsmill Stud resident Kalanisi, KALASHNIKOV was sold at the 2013 November NH Sale by his breeder Sunnyhill Stud to Paul Murphy for €35,000. In the Grade 2 Nickel Coin Mares' Bumper, Tattersalls Ireland Store Sale graduate THE GLANCING QUEEEN came to the fore, winning the race for trainer Alan King, owners Dingwall, Farrell, Hornsey and Murray and jockey Wayne Hutchinson. A graduate of the 2017 August NH Sale, THE GLANCING QUEEN was purchase for €8,500 from Ballincurrig House Stud to Colin Bowe's Milestone Stables.